Welcome to our in-depth guide covering boiler installation costs. If you’re looking for a new boiler, there’s a good chance you’re confused by all the options. After all, there are tonnes of national installers such as Help-Link and British Gas, local installers, and even online quote comparison websites like BOXT. Which company do you choose? This guide covers everything you need to know before buying a new boiler. In fact, we’ve even included a replacement cost comparison guide (with ACTUAL quotes we received), showing back-to-back prices from the likes of British Gas, BOXT and Help-Link. BOXT are a company part owned by Bosch. What does that mean? They get Worcester Bosch boilers DIRT cheap. If you want a quality boiler fitted at a low price, this is where we’d be going. After consulting a few local Gas Safe engineers, and taking into account our own prices, we’ve come up with some estimates of labour prices for boiler installation. So, the big question is, how much does a new boiler cost, fitted? You’re going to hate me, but the replacement cost of a boiler depends on SO many factors. However, we’ve created a few estimates, to give you a gauge as to whether the quote you’re being offered is reasonable or not. These are prices based on a reputable boiler brand in the 24kw-30kw range. Want an exact price? Use this boiler quote calculator. The prices we’ve mentioned above, are typical for your average local installer. Having worked in a plumbing merchant, there’s no doubt in my mind that large national installers get a MUCH better deal on the purchase cost of the boiler itself. But, due to their high overheads, the fitting costs relating to labour only, tend to be a lot higher. Below, there’s a cost comparison to give you an idea of what you should expect, when comparing a local boiler installation company, with the larger firms. For now, we’ve just included the most well known (British Gas), another large national (Help-Link), and a new kid on the block (that offer surprisingly competitive prices), BOXT. British Gas are one of the biggest companies in the boiler replacement industry. They fit a tonne of boilers. So, if you’ve already had a quote for a new boiler, there’s a good chance it’s come from British Gas. However, regardless of the national firm (British Gas, e.ON, AA and so on), it’s unlikely that this is the way to get the cheapest quote. 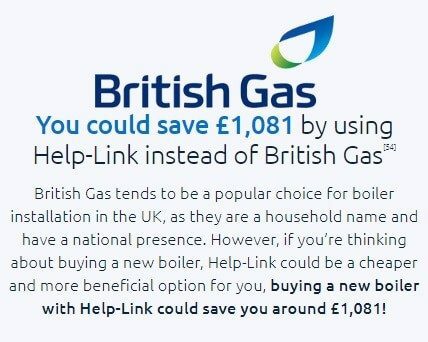 In fact, looking at British Gas directly, even Help-Link (a national boiler installation company mentioned below) are cheaper. They (and I quote) claim to save on average, £1,081 when compared with a new boiler quote with British Gas. And, from my experience, you can expect to save a little more by using BOXT. Typically, we’d expect to see a saving of AT LEAST £1,000. The bigger and higher the price of the job, the more you’re likely to save. Searching through a few online forums also reveals that what we guess, is true. Here, someone had quotes ranging from £2,350, through to £7,000 from British Gas (source: https://forums.moneysavingexpert.com/showthread.php?t=5853164). What we’re comparing here is a like-for-like quote. Quotes will vary. Some quotes will include upgraded controls, boiler filters and more, others won’t. And, it’s important to take that into account. So, are British Gas too expensive? Like all national companies, they have large overheads that have to be accounted for. A cute penguin for TV adverts might get your name out there, but TV adverts aren’t cheap. A local installer will usually be much cheaper than a large national installer like British Gas. As will quote comparison websites like BOXT. British Gas don’t allow you to get an instant online quote for a new boiler. But, there are a few companies that do; BOXT are one of them. And, BOXT have really shaken up the boiler replacement industry. The good thing about BOXT, is you can log on, right now, and get a fixed quote for a new boiler. There aren’t many companies offering that. We went through their quote process, to see what the prices come out at. And to be fair, we’re happy with what we saw. After some research, we realised why all the boilers on offer are Worcester Bosch, and why they were so cheap; Bosch own 45% of the company, so obviously give their BOXT installers a preferential rate. The new boiler cost we were looking for, was going to be suitable for a 3 bedroomed flat. As you go through the quote process, you’ll see questions such as the type of flue, where the flue is located and how close it is to windows and doors. For simplicity’s sake, we made sure our answers meant there’d be no additional work, besides the boiler swap. Once we completed the quote process, we’re given lots of different boiler prices (about 10 in total). Obviously knowing boilers, we knew the Worcester 25I isn’t just a good boiler, it’s perfect for our property. £1,845 is a great price for a new boiler, especially a Worcester. And, there was also the option for the equivalent boiler, in compact form (so, it would fit in a kitchen cupboard). That’s a little more, but still a great deal. As you scroll down, you’ll start hitting more expensive and higher output boilers. For example, the 30I you’ll see is the more powerful version of the 25I. Overall, the cost of a boiler replacement from BOXT, is nearing on being as cheap as a local installer. Have a look at the quote process, you can get a new boiler quote, without committing to putting in email addresses, phone numbers and so on; it takes about 3 minutes. Check out our guide to BOXT here. Another place you can get a online boiler replacement quote, is Help-Link. Ironically, it’s the ex-bosses of Help-Link, that went ahead and started BOXT. But anyway, we went through their online quote process, just as we did with BOXT. This isn’t a fixed quote, and we think that’s fair enough, sometimes a site visit is necessary. Like the BOXT quote form, we picked all the simplest options, making this a straight boiler swap, rather than a full-on installation or central heating upgrade. And to be honest, I wasn’t that impressed. Help-Link quote us here, over £2,000. And, whilst that might not seem like a big difference to the BOXT quote above, they’re quoting us for a Ideal Logic 24kw boiler. Now, if you’ve read many of my other posts, you’ll know I rate the Ideal Logic Plus range. But, as far as I can see, the Logic 24 HE, isn’t the plus, and that means you’ll only get a 2-year warranty. Typically, I’d be aiming for a 5-year warranty as a minimum. You can grab 7-years upwards from a tonne of boilers such as the Ideal Logic Plus, the Worcester Greenstar range, as well as others from Baxi, Vaillant and Potterton. So, my opinion on the Help-Link boiler replacement, is that it’s expensive. The option for a Worcester equivalent was £406 more, putting this boiler replacement price at over £2,500; essentially, it’s the same job as the one we got a quote for on BOXT. Where Should You Get Your New Boiler Quote From? Get quotes until your heart is content. You can read dozens of articles like this one, trawl forums and more, but that’s only going to give you an estimate. The fact is, costs do vary depending on property, the area you live in, type of boiler, warranty, additional works and more. Personally, I think the best deals come from BOXT. Being part owned by Bosch, it’s hard for companies to compete with their prices, which start as low as £1,795. Nationals just have too many overheads to cover. And inevitably, that’s going to be added onto your boiler quote. As we’ve highlighted above, these nationals can be £1,000 more expensive on many occasions. As cheap as local boiler fitters are, there’s no doubt that websites that offer an instant online quote facility, like BOXT, are hot on their heels. So, it’s worth comparing local boiler fitters, with a BOXT quote too. Finally: Do You Need To Replace Your Boiler? Not every appliance needs replacing. Sometimes, a repair is a more cost-effective solution. Typically, you’ll want to start investigating a new boiler quote, if your boiler is out of warranty, and there’s a repair bill looming of £500 or more. Boilers are expensive to fix, and these fixes can be covered by warranties. And, that’s not to mention the fact that there have been plenty of studies showing a new A-Rated boiler could save up to £305 per year in energy. Between zero repair costs and energy savings, a boiler replacement can quickly pay for itself. Looking to get an idea of what a new boiler will cost, and for a boiler replacement price estimate? Spend 2 minutes using this clickable form, and get your fixed price on screen instantly. And, if you have any questions, leave a comment below.